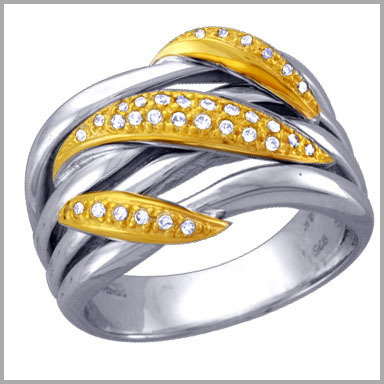 Sterling Silver / 14K Gold Diamond Overlapping Wave Ring.price includes 30% discount. Exude confidence with a refreshing wave of flattering light. This ring is crafted in polished sterling silver and 14K yellow gold. Three overlapping wave designs feature 34 full round cut diamonds in prong settings--a brilliant feat of sheer elegance. The total diamond weight is approximately 0.26ct with a color of H-I and a clarity of SI-3. The setting size is 1/2" x 13/16" with a height of 1/8".